I’ve been told on a few Facebook comments that over the holiday break I inspired some friends to “cut the cord”. 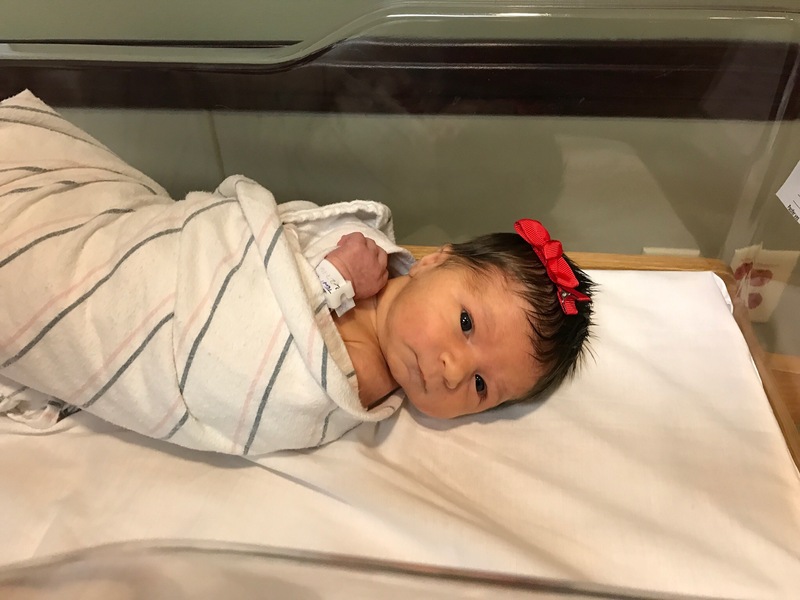 The specific type of cord-cutting they’ve been inspired to try is up for debate, since we welcomed a new baby daughter into the world AND switched our home entertainment services from cable to streaming over the last two weeks. But, I’m guessing most people meant they were thinking of cutting the Cable TV cord. I shared quite a few details of my analysis & decisions in disconnected Facebook posts, but haven’t provided a consolidated summary of my design and how it’s working so far. So consider this that summary now that all of the pieces are final and in place. And I’ll try to describe what I did and why in an orderly and understandable way. 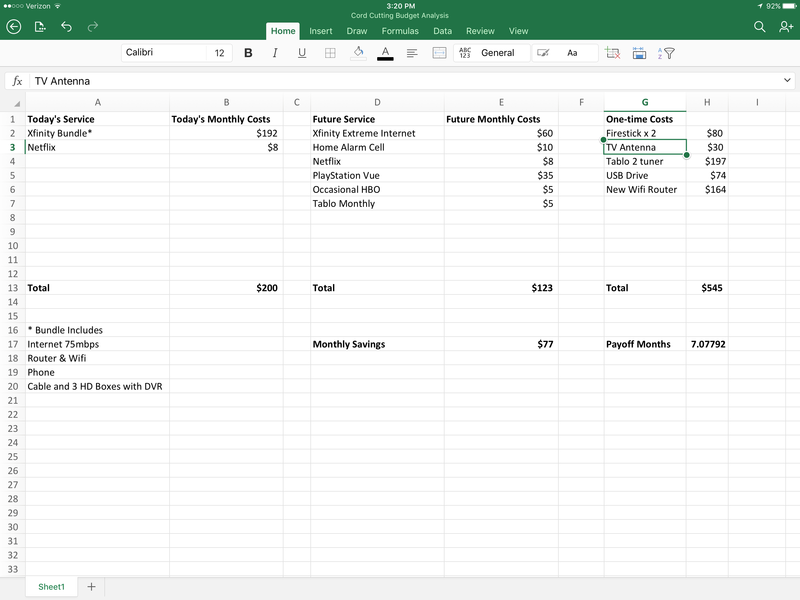 The clear and primary objective was to reduce recurring monthly expenses, as our cable bill not only felt high to us, but also kept going up despite our efforts to keep it manageable. And I wanted to be careful with the upfront investment to try and break even in about 6 months. In early December 2016 we were told by our cable provider that we were no longer eligible for loyalty promotions that were keeping our bill somewhat tenable (even as a 12 year customer) and that our Triple Play package (cable, phone & internet) with three HD DVR TV boxes was going to jump another $20/mo to $192 / month as of January 2017. And that’s without having HBO and NFL Red Zone any longer, which I’d previously had and enjoyed but eventually cut to save costs. Plus we already had Netflix and Amazon Prime and wanted to keep those. Sports, sports and more sports (Local & National) – I’m a big sports fan. Particularly golf, football and basketball at any level. Local teams (Colts, Pacers, Butler, Louisville, IU, Purdue) and national sporting events. So accessing the major Indianapolis local networks LIVE, not just on demand, was a requirement. As well as major cable sports stations such as ESPN, ESPN2, NFL Network, BTN, NBA TV, Golf Channel, Fox Sports stations and very specifically…Fox Sports Midwest (most Pacers games televised there). Same Capabilities on All Three Televisions – Three floors in the house, three different types of HDTV’s of varying size, age and sophistication. Whether sending the kids to watch something on a different floor, or hosting neighbors or friends, we wanted the same Capabilities & access to all our subscribed content no matter where in the house. Also, of those three existing TVs, only one is a Smart TV that could currently access Netflix and Amazon Prime “built-in”. Although we did already have an Amazon Fire TV on another TV for accessing each. But the basement TV had been relegated to cable TV access only, no streaming content. Phone Service for Home Alarm System – We weren’t married to having a home phone vs. our cell phones any longer, but had kept it for connecting to our home alarm system and for the kids to be able to call 911 if needed. Fast Internet Service – We’d had 75mbps service for years at home, and at a minimum didn’t want to go backward given we’d be added to the consumption load, particularly over WIFI by switching to more streaming services on more devices by getting rid of cable. Specific Channels – AMC, TNT, Disney, USA, FX & FXX, TBS, News Networks, etc. I’d actually researched doing this about 6-9 months prior with a SlingTV & Tivo combo, and decided at that time it wasn’t worth it to achieve our requirements. Our cable bill then was only about $150 / month with active promotions AND the options that I evaluated for being able to DVR the content I wanted across all content and all three TVs was going to be too expensive to justify the switch. The time to recoup my upfront investment was around 12-14 months and I still felt I was giving up a lot of capability vs. our cable situation. So I ruled it out then. BONUS: I had a couple weeks off of work for the holidays to focus more time on it!!!! Than helped too. TV Streaming Devices: 1 Amazon TV & 2 Amazon Firesticks – Each TV needed to be able to consume Netflix, Amazon Prime, PlayStation Vue & Tablo apps over wifi. We already had one Amazon Fire TV upstairs, thus only needed to add two new Amazon Firesticks for other TVs. Even the LG Smart TV needed a new Amazon Firestick in order to connect to the PlayStation Vue & Tablo apps as they aren’t currently supported via LG Smart TV. Streaming Services: Netflix, Amazon Prime, PlayStation Vue Core Slim ($35/mo tier) – Plus planned occasional monthly upgrades to HBO based on new content (Game of Thones, West World) and potentially NFL Red Zone ($40 / season when wanted). The beauty here is, with all other elements in place, I can swap out my selection of streaming services month to month if I really want. No long term commitments here. This is my choice of the current moment. But could change as needs & offerings change over time. Local Networks w/ DVR capability: HD Indoor Antenna & 2-tuner Tablo w/ 2TB USB Hard drive – Serves local network content to all three TVs (and mobile devices!) with only one antenna and one DVR source. Also add $5/mo Tablo subscription service for upgraded TV guide & DVR experience. 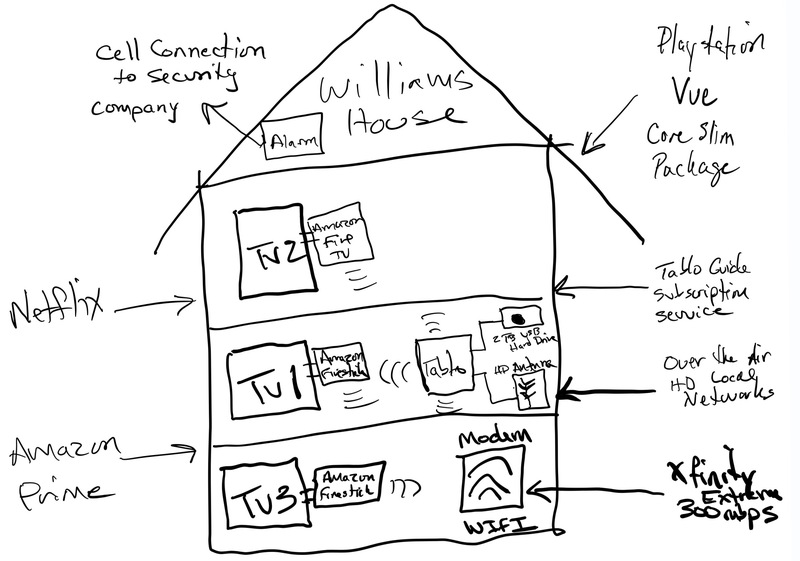 Internet Service: Xfinity Extreme & Motorola Modem/WIFI Combo – Keep current internet provider but with new internet only plan (this was the hardest part of the entire experience) & purchase newer / faster modem & WIFI router combo to replace Triple Play modem/router I was renting on a monthly basis from cable provider. Home Phone / Alarm Connection: Alarm Cell Block – Converted home alarm system to a dedicated cell block instead of a home phone that communicates with security company, and can be used to call 911. Removed home phone number. Less per month than having a home phone, with no upfront cost from existing alarm company. For the most part the change was smooth, when I had time to focus on it. The hardest part was that all of the new hardware I ordered arrived while we were in the hospital for our newborn baby. So I was sitting on having the tools to finalize the project, but had to wait a week or so until I finally had the time to dedicate to completing the new set up throughout the house. Tablo & Hard Drive – I started out trying to test HD antenna location in the house for the best signal, but I was getting a lot of connection failures to the Tablo device as I placed the antenna in different locations and tried to serve up the antenna content through the Tablo. Turns out, I was testing without having the hard drive attached to the Tablo because I didn’t think it mattered if I wasn’t testing DVR yet, only antenna reception. Through some trial and error, not having the hard drive connected and configured impacted performance of the Tablo, maybe due to content caching? Not sure. First obstacle cleared once I attached the hard drive. HD Antenna with Amplifier – I learned pretty quickly that the included amplifier didn’t help for someone close to the “big city”, it actually made reception worse. Once I removed the amplifier, I was getting strong reception from the key local stations we wanted to receive over the air. Tablo & Antenna – Once I’d connected the hard drive to the Tablo, things were working really well, but I still had to hide the wires better around our family room TV. I had temporarily placed them in plain sight for easy testing before finalizing the location of everything, but that aesthetic was NOT flying with my wife. This is where the human error story comes in to play. While squeezing behind the entertainment center to hide the wires to finalize my now trusted configuration, I re-connected the Tablo box to the wrong coax cable. Instead of connecting it to the new HD Antenna that was perfectly positioned for great reception, I unknowingly connected the Tablo to a coax cable abandoned behind the TV, obsoleted by removing the cable boxes. But the other end of that abandoned cable…connected to nothing but air. Amazingly, most of the OTA channels continued to work except for our local Fox network, and I couldn’t figure out why, distracting me from discovering the truth sooner. I moved that antenna and rescanned channels about 30 times, perplexed why it once worked and now would not work. About two days later I finally climbed behind the TV again and discovered what I’d done. I was simultaneously relieved and completely ticked off at myself for being so dumb. But once I connected it to the proper coax, back to perfect reception on all of the key local network stations we wanted to watch and record via the Tablo. Establishing Internet Only Service vs. Triple Play with Cable Provider – Let’s just say that it’s a lot harder to get offered a good deal from a local monopoly when you’re downgrading services with that provider. I was removing cable and phone, but wanted a good price on an internet service level at least as fast as what I had with triple play. I had 75mbps before, and all other competitor options I researched maxed out at 18-25 Mbps. It got complicated because on one phone call we were told we could leverage a specific promotion at a fair prices for 300mbps when we were ready to change our service, but once everything was in place (after being in the hospital for 4 days) and we called back to make the changes official…they told us we weren’t in fact eligible for that promotion due to downgrading services with them…and the alternative prices they were willing to offer were about double what we were expecting. This is where we learned (confirmed) how much better of a negotiator my wife is than I. So from now on, she makes those calls. Keeps my blood pressure in check. But we got pretty close to what we wanted and still have great internet speed & performance without breaking the bank. For now…I have a feeling the drama around this will haunt us on an annual basis. Learning Curve – I’ve had to do some teaching about which apps you open to watching which channels, and what you choose in each service to “record” that content. The experience between Vue & Tablo are a little different in that regard, but I think everyone is getting it. Mostly. And of course the FF & RW behaviors are slightly different across each service. But we’re figuring that out as well. CBS Content – PlayStation Vue has on demand access to NBC, Fox and ABC programming, but not CBS. If I hadn’t gotten the Tablo for OTA DVR, we likely would have had to also subscribe to CBS All Access. Because there are quite a few shows on CBS that we like to watch. But I was able to avoid that subscription by being able to DVR CBS shows from our local OTA network via the Tablo. So now I have the confusing outcome where all of our CBS shows are on the Tablo DVR, but everything else we watch across NBC, ABC, Fox, AMC, etc. we have to find via PlayStation Vue. But that’s a small inconvenience. I’m thrilled with the results and actually find the experience better than we had with cable. I’ve only had a few gotcha moments (service hiccups during first half of a college football game that went away by 2nd quarter, limitation of 2-tuner Tablo instead of 4-tuner when visiting guests wanted to simultaneously watch network programming on three different TVs), but those have been far outweighed by the benefits I can already see and the cost savings on the way in a few short months. In fact, my kids also love the games they can play on the TV through the Amazon Fire TV & Sticks. We happened to have an Amazon Fire Game Controller that they’ve loved using for some of the games offered by Amazon. My son even thinks it’s just as nice as having a new PlayStation or XBox game console. Glad we have him fooled on that one…for now! Check out YouTube TV. Has everything you asked for. It is one of the best services out there right now. I found about your blog from your dad. He posted a link to your blog in the cord cutters forum. Thanks Terry! I’ve looked a little at it, but since I’ve purchased all Amazon Fire Sticks, waiting until they at least support those. And they don’t yet! But otherwise looks pretty comparable. Thanks!